The 2018 Tabbies b2b awards program is drawing to a close! Submissions are still being accepted from both print and online publications. This competition, celebrating its 15th year, allows all b2b editors, publishers and art directors the opportunity to have their best work judged by their international peers. The Tabbies international b2b magazine competition encompasses 18 categories, and is open to English-language business-to-business publications around the world that are published at least three times per year, as well as b2b online publications. Unlike some more restrictive programs, publications are not required to maintain membership in any particular organization in order to be considered for the Tabbies—and entry fees remain among the lowest of comparable programs. 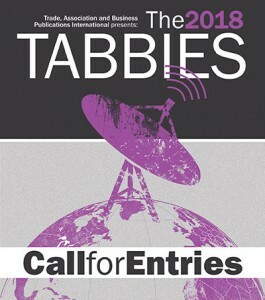 Categories in the Tabbies’ editorial division include: Best Single Issue, Department, Editor’s Column, Feature Article, Focus/Profile Article, How-To Article, Regular Column, Special Section, and Technical Article. Categories in the design division include: Feature Design, Front Cover, Digital Imagery; Front Cover, Illustration; Front Cover, Photograph; Front Cover, Special Issue; and Opening Page or Spread. The online division recognizes the most interactive, informative b2b websites, e-newsletters and the best use of social media.